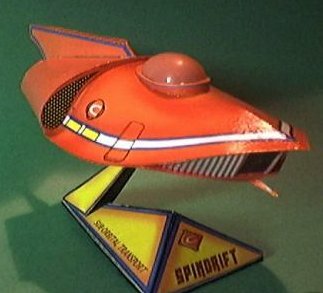 This is a paper model of the Spindrift Sub-Orbital Transport from Land of the Giants. Model is nicely detailed, and measure from 6 to 8 inches. There is a beautiful gloss krylon liquid plastic finish on it to protect this fine model. 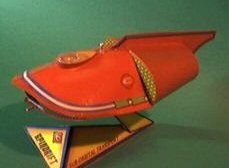 A nice addition for any Irwin Allen fan. This model is custom hand crafted and unique. Artist, Mike Botelho of Canada.